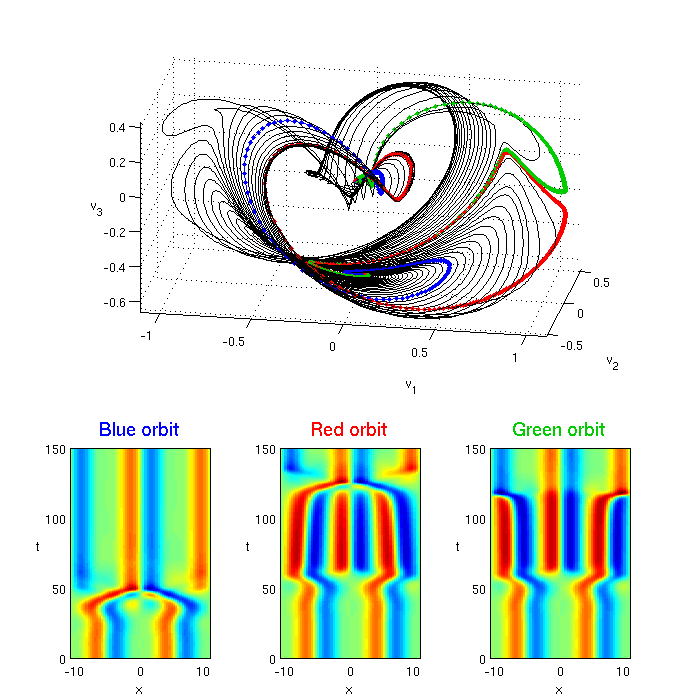 Kuramoto-Sivashinsky: an investigation of spatiotemporal "turbulence"
The nature of solutions depends on the system size L and on the initial u(x,0). basic wavelengths and appears "turbulent". The solution can be also viewed in the state space projections. 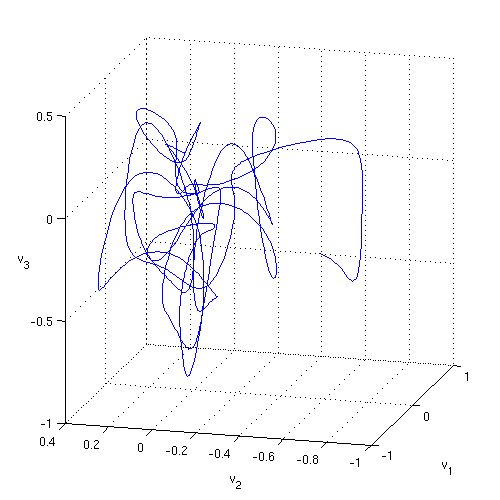 Here we span a 3-dimensional subspace by stability eigenvectors of the E2 equilibrium point (2-wavelength steady state). Start another solution with a nearby initial condition and see how it diverges from the first one. 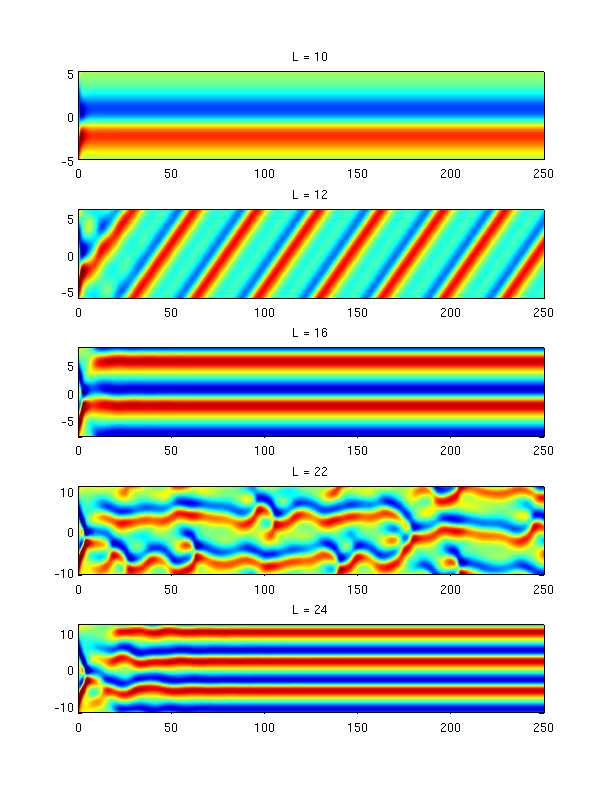 You might use such simulation as a starting point for evaluation of theleading Lyapunov exponent. 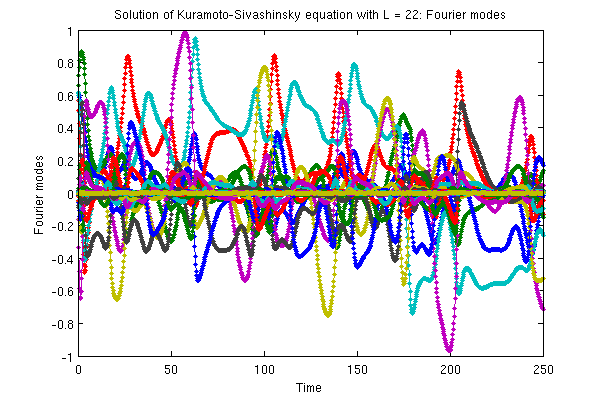 eq(k).a - coordinates of equilibria in Fourier space, k = 1,2,3 (there are three equilibria). tw(k).eig and tw(k).evec - as for equilibria, except that the Jacobian is calculated in the frame travelling with the wave (with speed c). 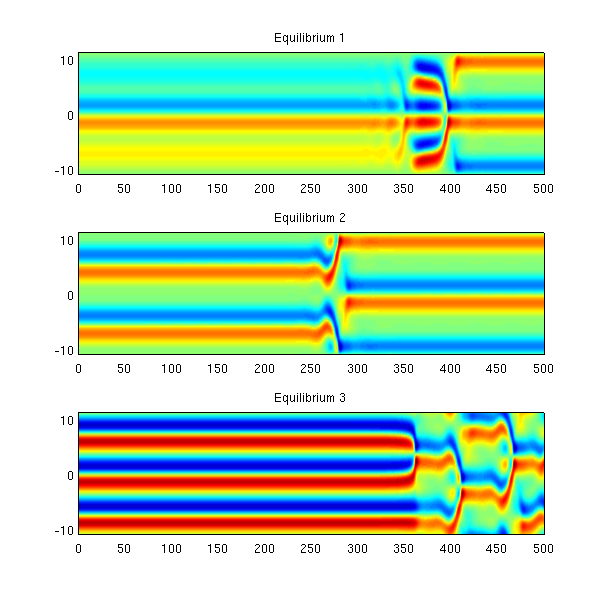 Here we plot evolution of solutions starting at equilibria. Since the equilibria are unstable and the initial conditions contain round-off errors, the solutions eventually move away from the equilibria. 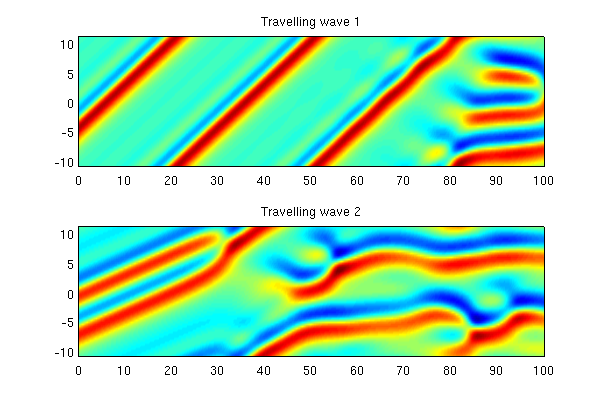 Solutions starting from the travelling waves can be plotted in a similar way. Here's an example of how to visualize the unstable manifold of Equilibrium 2 in the state subspace spanned by selected eigenvectors. where v_1 is a unit vector parallel to the real part of the unstable eigenvector. Coordinate axes (v_1,v_2,v_3) are constructed by Gram-Schmidt orhonormalization of (Re e_1, Im e_1, Re e_7), where e_j are the eigenvectors of the 2-wave equilibrium.